Fancy living like a rock star or cutting edge artist? No, not the part where they're in the studio or on stage, but the bits in between: the leisure pursuits that keep some of our favourite creators' minds nice and peaceful. In 6 Music’s The Leisure Society, Gemma Cairney has been speaking to the likes of Laurie Vincent of Slaves, Kelley Deal of The Breeders, Tracey Emin and more about their favourite pastimes and hobbies, and from her relaxing talks we've unearthed a few top tips for better living. Each episode of The Leisure Society is available as a podcast (see below), so you can download them right now. Want to get your green fingers working without putting your back out? Don’t worry - artist, author and Throbbing Gristle member Cosey Fanni Tutti has a way round it. "This is what it's about, it's about the earth we're on", she muses, before dishing out some practical gems. “If you’re doing veg and you don’t want to be out there in winter like me, put black polythene down on your beds,” she suggests. Bought a mat? Got the posh yoga-wear? Yet despite being a bit more flexible you’re not really feeling that yoga has improved you on a mental or spiritual level? Fear not, says drum and bass titan Goldie, it will come but you’ve got to commit. “I didn’t start yoga until I was 44. I’ve been practicing for four-and-a-half years, and now finally I’m up to four sessions a week again,” he admits. “One is just not good enough, two is getting away with murder, three is ‘Yeah!’, but when you reach four a week you’re made up! I wanted to reinvent myself as a human being and the yoga just comes with it.” Namaste. 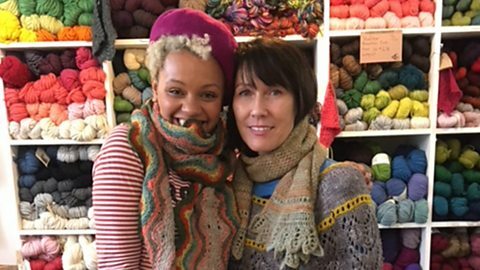 How did Kelley Deal discover her love of knitting? Guitarist Kelley Deal is a self-confessed knitting obsessive, taking her yarn on the road with her at every opportunity. Miss Marple is a thrower. I’m a picker. It’s no mystery who's the coolest knitter. The acclaimed artist Tracey Emin loves her home of Margate so much that if she wasn’t making installations she'd probably be working for the Kent seaside town’s tourist board. “Margate has this energy about it and I’ve always said to people: ‘You want a nice weekend, go to Brighton. You want a really dirty weekend, come to Margate because you’re going to have one!’” she declares. What makes the place extra special now, according to Emin, is the fact it’s been neglected as a holiday destination for so long. As one half of Slaves, Laurie Vincent doesn’t always have enough time for his second artistic passion: painting. No problem, he’s got technology to help… although it’s a bit more analogue than you might expect. “When it’s really cold, and I’m being impatient, I dry acrylic paints with my hairdryer,” he explains. However, before you plan to paint your masterpiece in a day, just double check you’re using the right materials. Follow us on Facebook, on Twitter @BBC6Music, or on Instagram @BBC6Music.